My videos are situated at the intersection of photography and film. I use cinematographic conventions and apply them to a still image. The videos depict people in intimate moments where something happened or is about to happen. In La Ronde and Momentum, the camera (and therefore the viewer) circles slowly around people who don’t move, as if they were frozen in time. The notion of film is reversed. The camera’s movement in space allows multiple views onto the scene. Closeness and distance towards the persons and objects alternate and make the viewer feel intimately close and at the same time excluded from the scene. 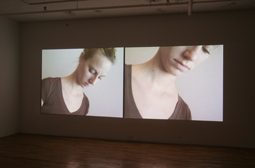 In the series of double projections, Décalage 1, 2, 3, the camera wanders slowly around motionless people, showing them from unusual and intimately close angles. The same scenario was shot two times in similar ways and later juxtaposed side by side. Sometimes the two images are almost identical, than they shift apart or complete each other for a whole image. The camera movement and the juxtaposition animate the still actors, bringing them apart, moving them together, and directing their gaze. Time is experienced in succession, repetition and simultaneity and leads, in conjunction with the fragmented image, to an altered perception.